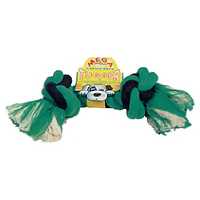 We stock a range of traditional rope dog toys including Knotted Bones, Raggers, Tuggers and Rings made from lightweight cotton that are extremely tough and durable, which are available in a variety of sizes and designs suitable for most breeds, including a figure of 8 toy that allows your dog to hold one end of the tug safely in their mouths, whilst you pull and play tug of war with them. Rope toys are tougher and longer lasting than rawhide chews, are relatively cheap and help floss your dogs teeth as your dog chews them, helping to prevent the build up of plaque and tartar build around your dog's mouth, but also satisfy your dog's instinctive urge to chew something to relieve stress and boredom. 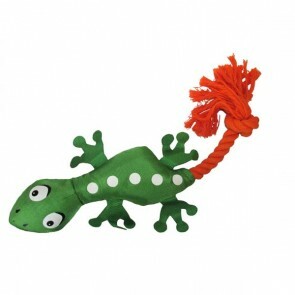 Rope toys also allow you to play and interact with your dog as they can be thrown, used in tug of war games or simply used as retrieval toy just like a rubber ball that are tightly woven and brightly coloured using natural dyes. Chewing a tough rope toy is also great exercise for your dog's gums and muscles, helping to keep their breath fresh and remove uneaten food deposits. Rope Toys: 5 stars out of 5 based on 3 user reviews. My staffie favourite toy is a extra large rope like this and I was finding it extremely difficult to find them in this size and quality.....until now, these are great!!! When I first ordered this I expected it to be quite flimsy and for my Goldie to destroy it within days or even hours. How wrong I was. This is no cheap piece of string. This is more like a tow rope. It is very durable and well worth the money in my opinion. My two Collies love this rope! they play tug o war every day, It's nice and long too, as many ropes you see for sale are very short, and long enough for two dogs to pull on, a great buy! well worth the money!.